Kansas Speedway – Welcome to Wyandotte Daily! Calling all Hazelnuts – Sister Hazel, whose songs have been on the charts in both the rock and country genres, will perform the pre-race concert at Kansas Speedway on May 11. The “All For You” band has been called “one of the Top 100 Most Influential Independent Performers of the last 15 years” by Performing Songwriter Magazine. In their first showing on the country chart, they made a strong debut with “Lighter In The Dark” at No. 4 on Billboard’s Top Country Albums, and #6 on Billboard’s Independent chart. Their most recent release “Water,” a six track EP, is Volume 1 of a collectible compilation series titled, “Elements,” and includes a bonus seventh track that will continue throughout the series. “Water” made its debut at No. 4 on Billboard’s Country Albums chart and No. 2 on Billboard’s Independent Albums chart. Pre-race passes for Saturday night, May 11, which allow up close access to the Sister Hazel concert and driver introductions are currently available online at www.kansasspeedway.com or by calling 866-460-7223. Pre-race passes must be accompanied by a grandstand ticket or RV admission. Tickets for the May 11 Monster Energy NASCAR Cup Series race and May 10 NASCAR Gander Outdoors Truck Series race are also available. Kansas Speedway, a premier motorsports facility in the Midwest, holds two NASCAR race weekends a year, in addition to holding approximately 200 other events throughout the year. Kansas Speedway’s first race weekend of the season is in May with the NASCAR Gander Outdoors Truck Series and Monster Energy NASCAR Cup Series under the lights. In the fall, the NASCAR playoffs return in with the NASCAR XFINITY Series and Monster Energy NASCAR Cup Series. To purchase season or single day tickets, call 866-460-RACE (7223) or log onto www.kansaspeedway.com. Kansas Speedway has announced its dates for the 2020 NASCAR XFINITY Series race and NASCAR Gander Outdoors Truck Series race. Both races will be run in conjunction with Monster Energy NASCAR Cup Series races, which were announced last week. Kansas Speedway’s NASCAR Gander Outdoors Truck Series race will run Saturday, May 30, while the NASCAR XFINITY Series race will be Saturday, Oct. 17. Start times and TV networks will be released at a later date. Racing returns to Kansas Speedway on Friday, May 10, 2019, with the NASCAR Gander Outdoor Truck Series and on Saturday, May 11, 2019, with the Monster Energy NASCAR Cup Series races. In October, the NASCAR XFINITY Series (Kansas Lottery 300) returns on Saturday, Oct. 19, 2019 and the Monster Energy NASCAR Cup Series (Hollywood Casino 400) on Oct. 20, 2019, both of which are playoff races. Kansas Speedway, a premier motorsports facility in the Midwest, hosts two NASCAR race weekends a year, in addition to hosting approximately 200 other events throughout the year. Kansas Speedway’s first race weekend of the season is in May with the NASCAR Gander Outdoors Truck Series and Monster Energy NASCAR Cup Series under the lights. In the fall, the NASCAR playoffs return in with the NASCAR XFINITY Series and Monster Energy NASCAR Cup Series. Also in October, the ARCA Menards Series returns to Kansas Speedway. For ticket information, call 866-460-RACE (7223) or log onto www.kansaspeedway.com. 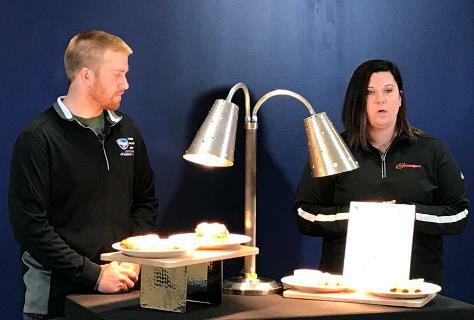 Monster Energy NASCAR Cup Series driver Chris Buescher visited Kansas Speedway today to help introduce new food items on the menu for this year’s races. Buescher also participated in pre-race operations activities, including helping to stripe the racetrack. “It’s OK if I make squiggly lines, right?” asked Buescher under the watchful eye of Kansas Speedway’s operations team as he wheeled the line painting machine on the track, in the area that separated the track from the apron. Buescher “joined” the Kansas Speedway operations team as they start preparing for the upcoming Monster Energy NASCAR Cup Series race on May 11. Buescher, from Prosper, Texas, has competed at Kansas Speedway several times, placing sixth in 2017 at the Hollywood Casino 400. • Chimichanga dog – an all-beef hot dog with pulled pork, deep fried in a flour tortilla, and served with a beer cheese dipping sauce. • Open-faced sandwich – Garlic bread topped with meatballs, marinara and mozzarella. Buescher and the rest of the Monster Energy NASCAR Cup Series return to Kansas Speedway on May 11, while the NASCAR Gander Outdoors Truck Series returns on May 10. For ticket information, call 866-460-RACE (7223) or visit www.kansasspeedway.com.